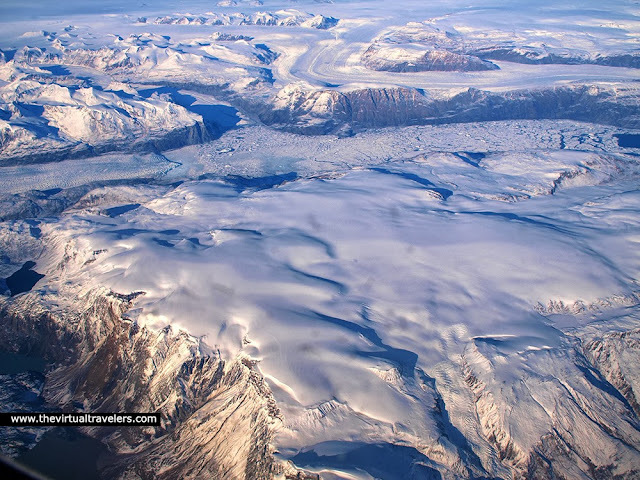 The Virtual Travelers: Why is it called Greenland? 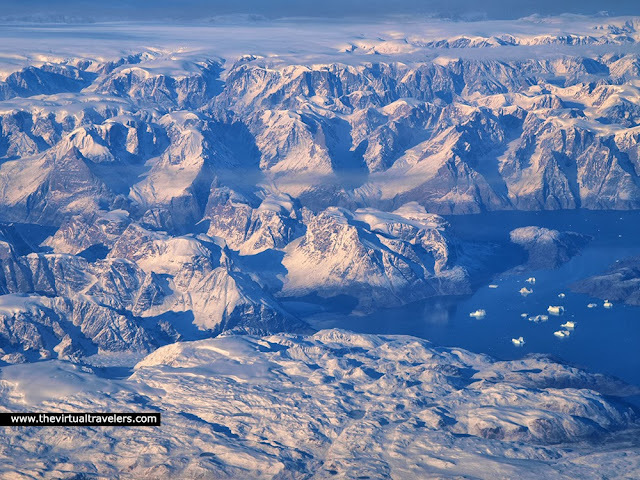 Have you ever wondered how did Greenland got it's name? Two days ago, I flew over Greenland on my way to the US, the scenery was breathtaking. If you look at the map below you will see how icy it is compared to it's neighbor Iceland. According to Wikipedia; It was the early Scandinavian settlers who gave the country the name Greenland. In the Icelandic sagas, it is said that the Norwegian-born Icelander Erik the Red was exiled from Iceland for murder. Along with his extended family and his thralls, he set out in ships to explore icy land known to lie to the northwest. After finding a habitable area and settling there, he named it Grœnland (translated as "Greenland"), supposedly in the hope that the pleasant name would attract settlers. The name of the country in Greenlandic (Kalaallisut) is Kalaallit Nunaat ("land of the Kalaallit"). The Kalaallit are the indigenous Greenlandic Inuit people who inhabit the country's western region. Greenland (Greenlandic: Kalaallit Nunaat [kaˈla:ɬit ˈnuna:t]) is an autonomous country within the Kingdom of Denmark, located between the Arctic and Atlantic Oceans, east of the Canadian Arctic Archipelago. Though physio-graphically a part of the continent of North America, Greenland has been politically and culturally associated with Europe (specifically Norway and later Denmark) for more than a millennium. In 2008, the people of Greenland passed a referendum supporting greater autonomy; 75% of votes cast were in favor Greenland is, in terms of area, the world's largest island, over 3/4 of which is covered by the only contemporary ice sheet outside of Antarctica. With a population of 56,370(2013), it is the least densely populated country in the world.